I know some preppers who would like to store more water, but they just don’t have enough space for it. I often hear this complaint from people who live in apartments. If their water runs out, they could find a stream or pond and run the water through a Big Berkey or a Katadyn Pocket Water Microfilter or something similar. But the problem with that idea is twofold: most city dwellers don’t have a source of water nearby, and during a disaster it might be too dangerous to go out and collect water. If that’s the situation, then your best option might be to harvest rain water. It may sound like a simple solution, but harvesting rain water is not as simple as putting a bucket under your gutters. Many people believe rain water is pure and therefore safe to drink, but there are multiple pollutants in the air, not to mention all the contaminants on your roof such as dirt, bugs, bird feces, lead, and arsenic to name a few. 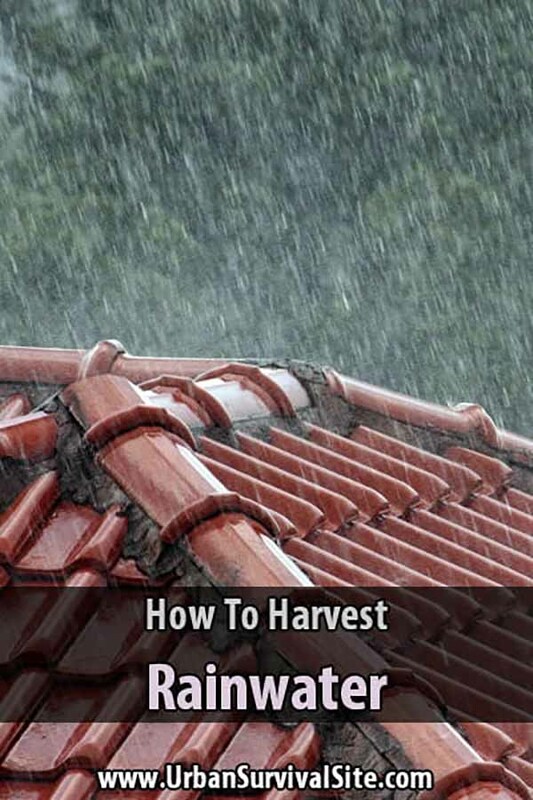 Before harvesting rainwater, you should check to see what type of roof you have. But either way, you’ll have to purify it. If your roof has been treated to make it resistant to rot, if it has asphalt shingles or concrete tiles, if it is made from copper or galvanized metal, or if it is a flat tar roof you’ll want to be very cautious and make sure the water is completely and thoroughly filtered before using it. In fact, the only types of roofs I would feel safe drinking water from without filtering are steel or glazed tile roofs. 1. Let the rain wash your roof for five minutes before you start collecting rainwater. This will remove most of the larger contaminants from it. 2. Make sure you run the water through a good screen to capture all the large particles such as leaves, bugs, and other small objects. 3. After this, run your water through a good water filtration system like one of the ones I mentioned above. You’re also going to need a good rain barrel to store it in. It doesn’t need to be anything fancy. The only thing I would suggest is that you get a black rain barrel, or you could least paint one black. Doing this will block the sunlight and minimize algae growth. If you can, try to keep your barrel somewhere it will be in the shade for most of the day. An example of a good rain barrel is this Home Accents 50-Gallon collection barrel. However, there are many types and designs so you should be able to find one that will work best for your house or apartment. Depending on your gutter system, you might need to get a rain diverter. Also, remember that your rain barrel is going to be very heavy once it’s full, as much 500 pounds, so you’ll want to put it on a level, stable base made of gravel or concrete. And if you’re living in a SHTF scenario, it might be a good idea to hide your rain barrel from neighbors and passersby with plants, trees, or anything else that won’t look conspicuous. One final note: Due to unsanitary roofs, many governments are trying to make rain harvesting illegal. Before harvesting rain water, check the laws of your local and state government and make sure you are in compliance (in some states, you just need a permit). Good luck, and stay hydrated! I’m thinking of letting the rain run through a gutter off my garage into a galvanized tub just to fill my watering cans for my small garden. Do you think that would work? It’s a slate roof. Sounds like a good idea. I can’t imagine it harming your garden. Great thanks! Have a happy New Year! Great idea Thompson. I am going to try this with a broken umbrella. another way to catch rainwater is to use an umbrella and a bucket. open the umbrella, punch a couple of holes in the top, and put it upside down over the bucket. if you have several umbrellas and buckets you can harvest all the water you need.